Three men and a cat were treated for minor smoke inhalation after a fire broke out at a home on 140th Street at 108 Avenue in Surrey Friday morning. 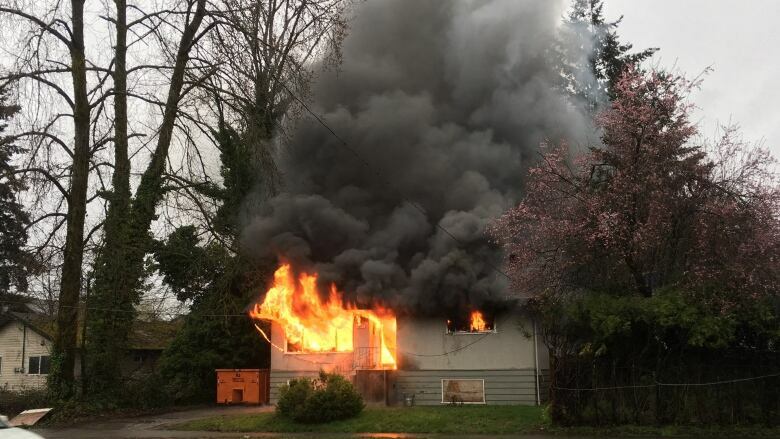 Three men and a cat were displaced from their home and treated for minor smoke inhalation after fire broke out at a residence on 140th Street at 108 Avenue in Surrey Friday morning. The fire started in one of the bedrooms, and the men escaped after being alerted by a smoke detector, according to Battalion Chief Brian Carmichael with Surrey Fire. "The home, when our fire crews arrived was fully involved ... there was fire on both floors and coming out the windows," said Carmichael. The fire completely destroyed the home and its contents. Carmichael said one man sustained a cut to his hand, and all three refused to be transported to hospital by ambulance. "There was one cat that got a little bit of a singe, and it's fine. The boys gave the cat some oxygen," he said. Approximately 25 fire personnel responded to the two-alarm blaze. Investigators are trying to determine the cause.